For many, the acquisition of wealth is a life-long goal. But what is it that steers the dreams and ambitions of those who are already wealthy? Having attained a level of comfort most of us will never know, what drives their hopes, their desires? For those few that inhabit the world of L’Avventura, the answer to these questions is both simple and disturbing: they haven’t the foggiest idea. The boredom and complacency of the upper class is pushed to the forefront in Michelangelo Antonioni’s 1960 classic, the winner of a special Jury Prize at the Cannes Film festival that same year. While on a yachting trip, a group of Italian socialites decide to tour a small volcanic island, where one of their number, the beautiful Anna (Lea Masseri), vanishes without a trace. Her lover, Sandro (Gabriele Ferzetti) and best friend, Claudia (Monica Vitti), begin a frantic search for her, wondering as they go what could have become of their beloved Anna. When a sweep of the island turns up nothing, Sandro and Claudia widen their investigation to include several towns in the outlying area, yet as their probe wears on, the two grow unexpectedly closer to one another, so much so that, after a few days, they no longer care if they find Anna at all. 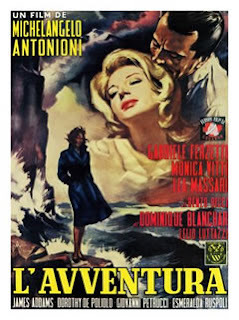 In the guise of a love story, L’Avventura is, in fact, an indictment of the total absence of feelings. Early on, Sandro is, by all appearances, deeply in love with Anna. Before leaving for the yachting trip, they make love in Anna's apartment as Claudia stands waiting in the street below (clearly, at this point, Claudia is little more than the proverbial ‘third wheel'). Then, Anna disappears, and Sandro and Claudia must join forces to find her. When their initial search of the island turns up nothing, Sandro shocks Claudia by making a pass at her. Over time, we learn that Sandro’s sudden interest in Claudia has nothing whatsoever to do with love; it is an affection born of self-interest. For Sandro to have remained concerned about Anna’s whereabouts any longer would've required a selflessness he simply did not possess. After spending an entire evening on the windy, desolate island with Claudia and their friend, Corrado (James Addams) in the hopes Anna might return, Sandro has grown weary of the whole affair. As far as he’s concerned, Anna is gone, and he must now turn his attention to fulfilling his own needs. What's even more shocking than Sandro's behavior is that he's not at all unusual; each and every character in this circle of “friends” acts in much the same way. The lone exception to this sorry state of affairs was Anna; from the opening scene, it's obvious she was feeling restless, confused, even bored, though she couldn't explain why. Her disappearance may have signaled an awakening of sorts, a sudden and jarring realization of the futility of her empty life. When Anna vanishes from L’Avventura, the light of perception goes with her, and the lost souls she leaves behind have little choice but to continue to wallow in their self-imposed darkness. Without knowing what happened to her, I found myself respecting Anna. I wanted to believe she simply walked away. Watching the other characters interact though the remainder of L’Avventura, I could see quite clearly that “walking away” would've been the right thing to do.